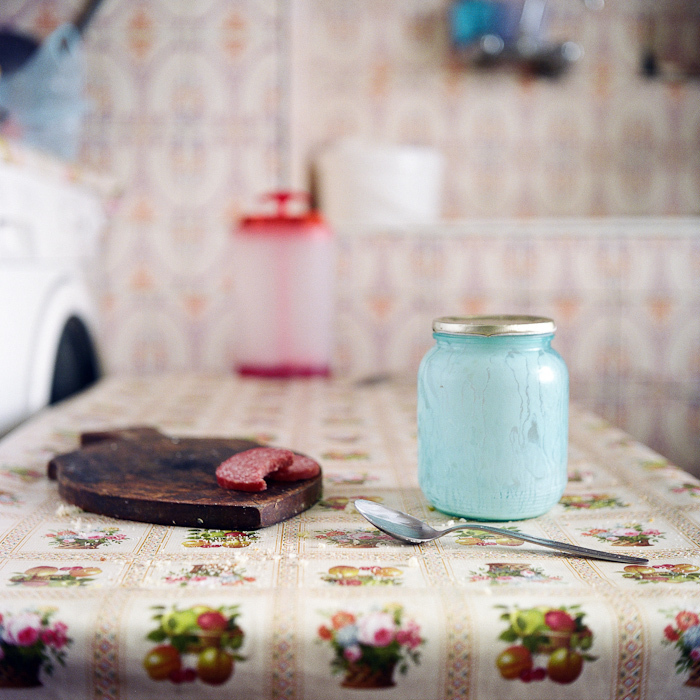 Eugenia Maximova’s images of present day Balkan kitchens are an homage to a place and a time, capturing an essence of home and an appreciation for detail. 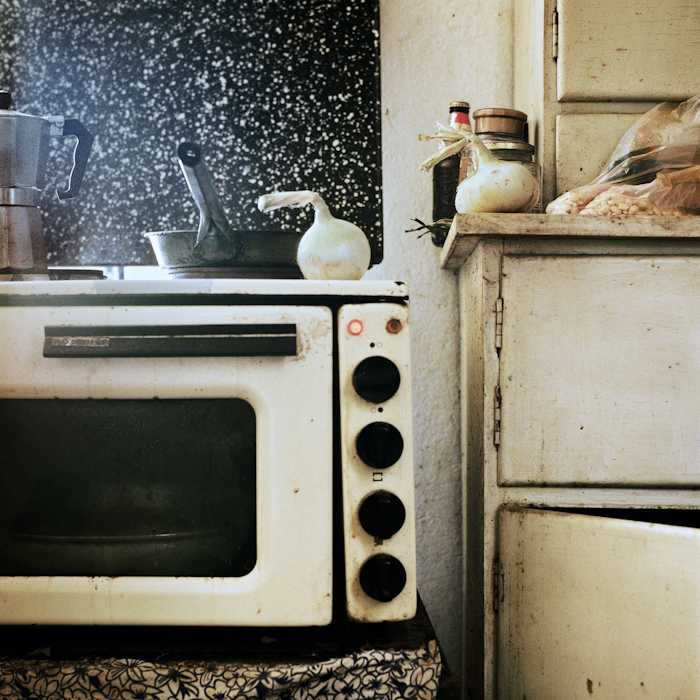 She moves intimately through various homes in the region taking still lifes of kitchen interiors. 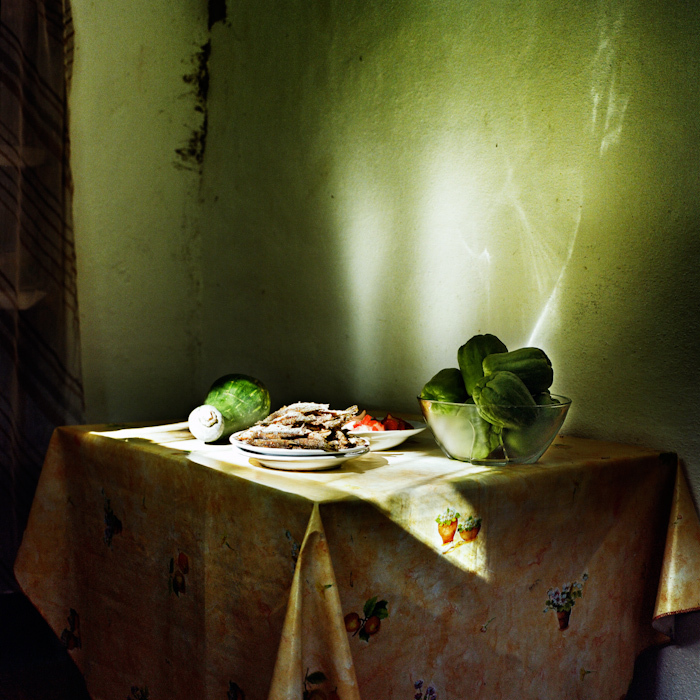 Using soft, natural light, she documents the tiny pieces that make up everyday life in the Balkans, leaving the viewer to decide on what happens outside the frame in each place. 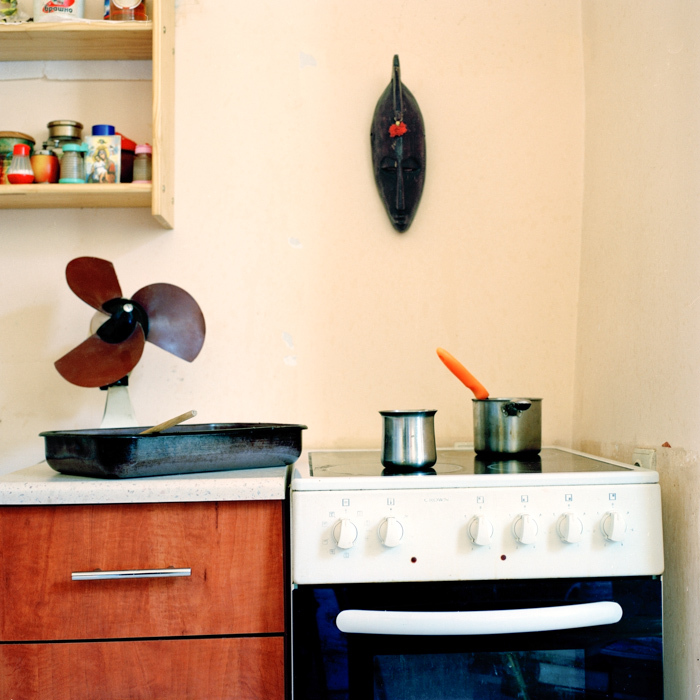 Abigail Smithson: How did you come up with the idea to photograph kitchens? 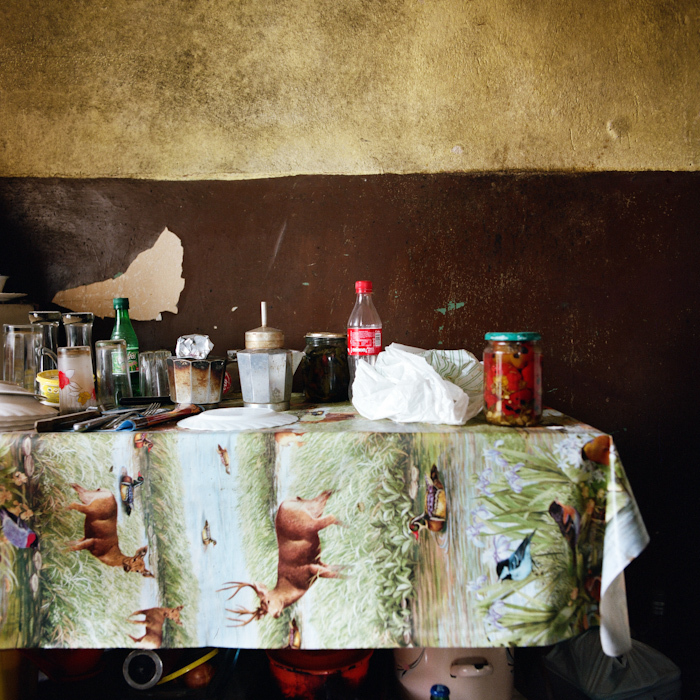 Eugenia Maximova: When I set out to tell a story about the Balkans, it was food that sprang to mind as being the only thing people in the whole region agree they have in common. After five centuries of Ottoman occupation we have all continued to eat the dishes they brought. Thinking about this shared culinary heritage, I began to wonder what was happening in Balkan kitchens these days. 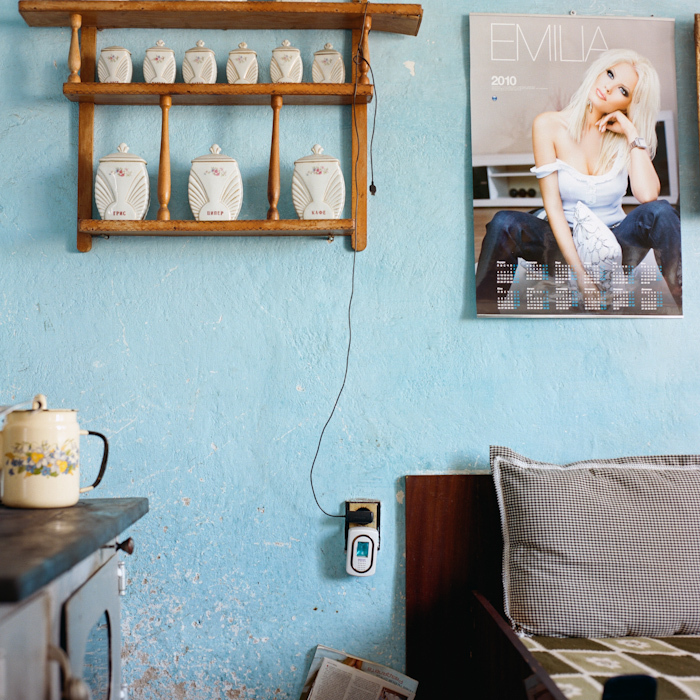 The kitchen is a multipurpose room, a space that reflects identity and self-perception. 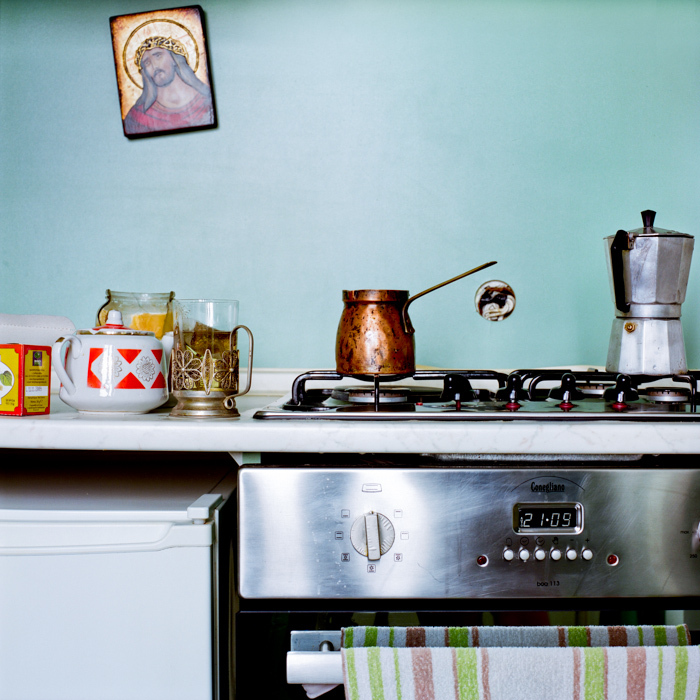 It embodies the spirit of the Balkan home and mirrors society as a whole. People in the Balkans would rather spend what little money they have in a café rather than on interior decoration, which in fact makes sense. The functional, unadorned style which results from this conveys a tangible sense of the region’s lost identity, the inevitable legacy of half a millennium under the Ottoman yoke and half a century behind the Iron Curtain. 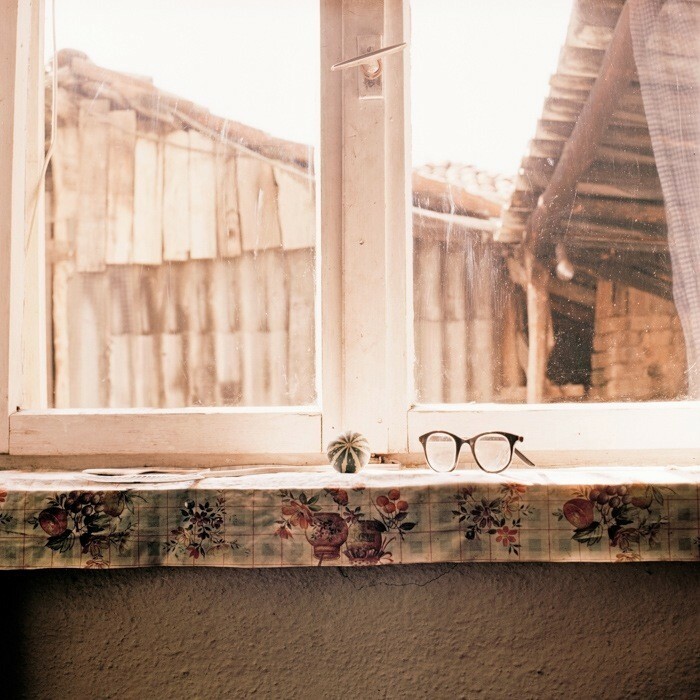 AS: These pictures are filled with scenes that relate feelings of hominess or nesting, but there are no people in them, just the evidence that they were there. What was your relationship with the people whose homes you shot? EM: I often avoid people in my projects for many reasons. One of them is that I want the viewer to actively participate in reading and decrypting the content of the pictures. I want them to imagine what’s outside the frame of the photograph, to think and feel the picture. Less information leads to a more intensive use of imagination, I believe. Faces in projects like this one only distract the viewer’s attention. I prefer to take pictures of things. I like slow photography. AS: Can you expand on the idea of slow photography? EM: What I mean by slow photography is when someone takes their time to consider what and why they are going to photograph before they do so. To check all potential angles, compositional possibilities and so on. I often use long exposure in order to photograph things in their natural environment without using artificial light. People quickly get bored, things don’t. That’s probably the reason that I still shoot still lifes. AS: Why do you think the kitschy items in the kitchens were important (both in the times of the Soviet Union and since)? Why are you attracted to them as subject matter? EM: Kitsch and the human propensity for exaggerating have always fascinated me. Many of my childhood memories relate to kitsch. It was on open display in almost every household growing up – crystal and ceramic dinner sets, vases and figurines, hard-to-acquire foreign objects, plastic fruit and flowers. They were showcased behind glass and were the pride of the house. The scarcity of goods during Communism created a culture of showing off, in which people behaved ostentatiously. Kitsch is melodramatic, sentimental and folksy, but it also entertains. 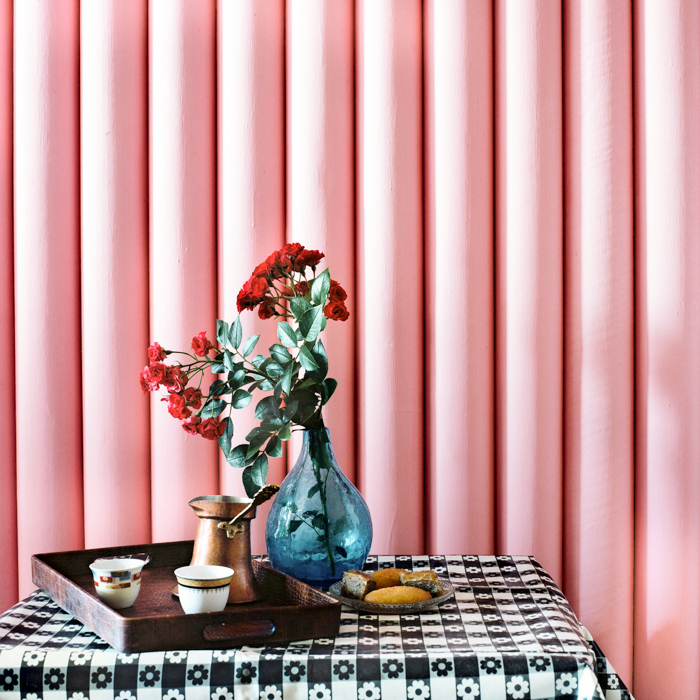 The kitsch culture of today flourishes across all areas of life. Kitsch is visual fast food- sometimes difficult to digest, but for many it is also unpretentious and tasteful. Kitsch doesn’t require lots of preparation, rethinking, and consideration. In fact it barely requires any thinking at all. Kitsch quickly responds to most basic human instincts. AS: Do you take pictures of your own things? EM: Actually, no. And that is probably because I am so used to what’s around me. Over time most of the things I own have lost their gloss, as always happens. I would prefer to explore new territories. AS: Did you rearrange the items in these photos at all or just shoot them as they were originally placed? EM: I would be lying if I say I never did, but I prefer not to. I would rather ask the owner of the house to set up a table or make an arrangement as she or he would do if I was a dear guest or wasn’t there at all, and then I try to find the best possible composition. AS: Can you describe your interest in shooting still lives and where documentary photography crosses over with it? EM: I’ve studied journalism and I am still very interested in it. I try to keep up with what’s going on around the world. My journalistic background influences many of my projects. And although they often differ from the traditional concept of ‘photojournalism’, the goal of my images is to bring to light the lives of others and to communicate socio-political models and tendencies and examine their consequences for society and culture. To see more of Ms. Maximova’s work, please click here. Her self-published book “Kitchen Stories from the Balkans” has recently been released. You can read more about it and make a purchase on her website, through the Anzenberger Gallery and the Photo-Eye bookstore.